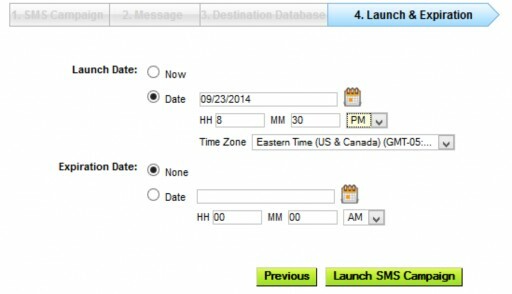 All SMS functionality and features are accessed during an SMS Campaign (except Keywords). 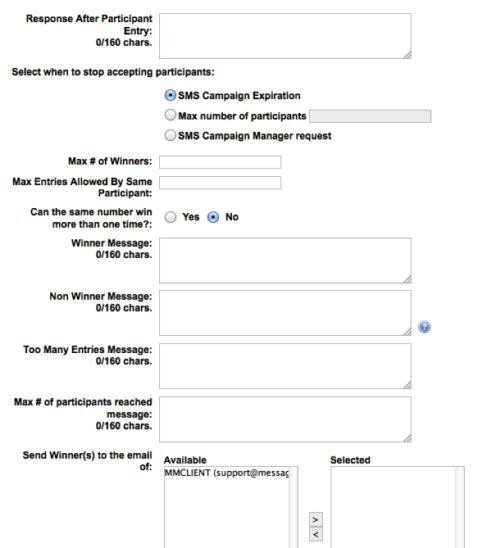 Throughout the Textboom application, “campaign” describes the process of compiling a text message engagement. If you want to create an Auto-Responder, Broadcast or a Txt 2 Vote, please remember that Textboom identifies these as individual campaigns. Note: If a keyword is necessary, you should create it before you prepare a campaign. You may access these tools from the SMS Campaign menu in the Textboom toolbar or the quick link icon on the Dashboard. The SMS Campaign Manager helps you manage all the aspects of your SMS campaigns. From the manager, you can execute all SMS campaign actions with ease. Once you create a campaign, it will be appear with all other active and inactive campaigns. Or by using the quick link icons that are located under the toolbar on the Dashboard. The following sections explain all the functions of the campaign manager that you can use to create your campaigns. On the left side of the report control panel, you’ll find a group of filters (below). Choose from one or more of these drop-down menus to filter by OC (Operating Company), Agency, or Client, Status, or Campaign Type. On the right side of the control panel, you can also filter by SMS Campaign Type. You might, for example, choose to view only the AutoResponder campaigns. Uncheck the box for Launch if you also want to see campaigns that have expired. 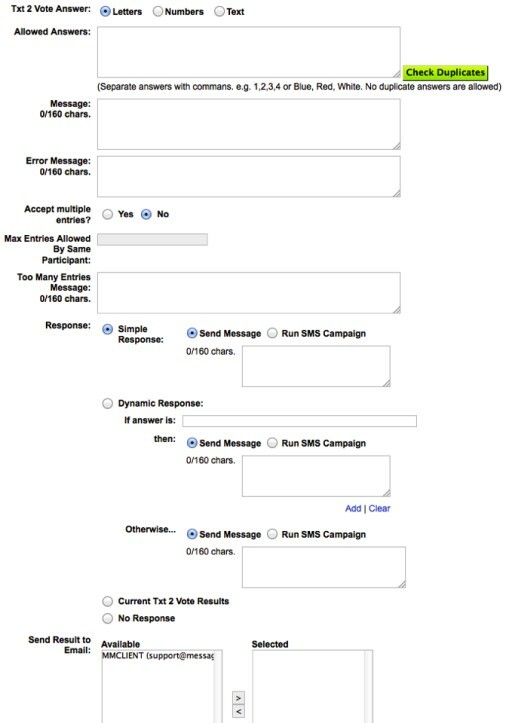 Check the Show Deleted SMS Campaign checkbox if you want to display campaigns that had been previously deleted. Click the From calendar icon (for example, enter 9/22/2014). Next, click the To calendar icon (you might enter 9/22/2014). Enable – enables a record that has been previously been disabled. Disable – Click this icon to disable the campaign. A disabled campaign cannot be used again until it is enabled. Delete – click this icon to delete a campaign. A deleted campaign is both disabled and invisible except when the Show Deleted SMS Campaign box has a check in it. The figure below displays the first few column headings. Underneath these headings, you will see a list of all your campaigns. Click this icon to view a popup showing the campaign message dialogue. Click this icon to edit the campaign (you will exit the Campaign Manager). Click this icon to cause the campaign to expire immediately. A campaign that you expire will no longer send messages. Click this icon to disable the campaign. A disabled campaign cannot be used again until it is enabled. Click this icon to delete a campaign. A deleted campaign is both disabled and invisible except when the Show Deleted SMS Campaign box has a check in it. Click this icon to enable campaigns that have been dis-abled. The Auto-Responder feature is a tool for creating campaigns that solicit responses through SMS text messages. We provide you with many options, and yet it’s quite easy to setup. 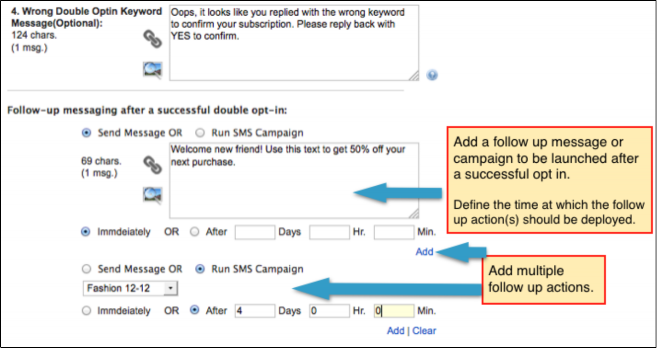 You may access this feature by choosing SMS Campaign > SMS Campaign Manager > Auto- Responder from the toolbar. 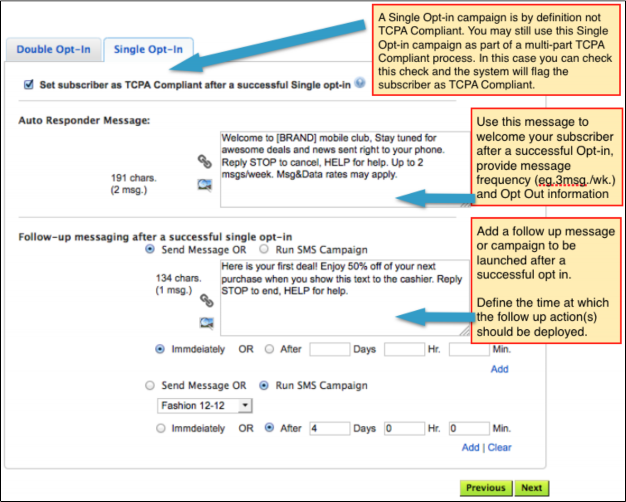 Don’t forget that you can access the SMS Campaigns by utilizing the quick link icons that are located under the toolbar on the Dashboard. After choosing this menu item, you will see a page much like the figure below. Also, choose a Keyword from the drop-down list (if any are available). Enter a SMS Campaign Name. Optionally, enter the SMS Campaign Notes. When you’re happy with the entries, click the Next button to continue on to the next step, Message. Auto Responder is designed to make your campaigns more exciting while remaining compliant with all the regulations. This gives users the ability to check each record for a previous double opt-in. This will allow the system to provide the appropriate message flow so records don’t have to double opt-in each time they text a keyword. Note: You can create an Auto Responder campaign as either as a Double Opt-in or Single Opt-in campaign. 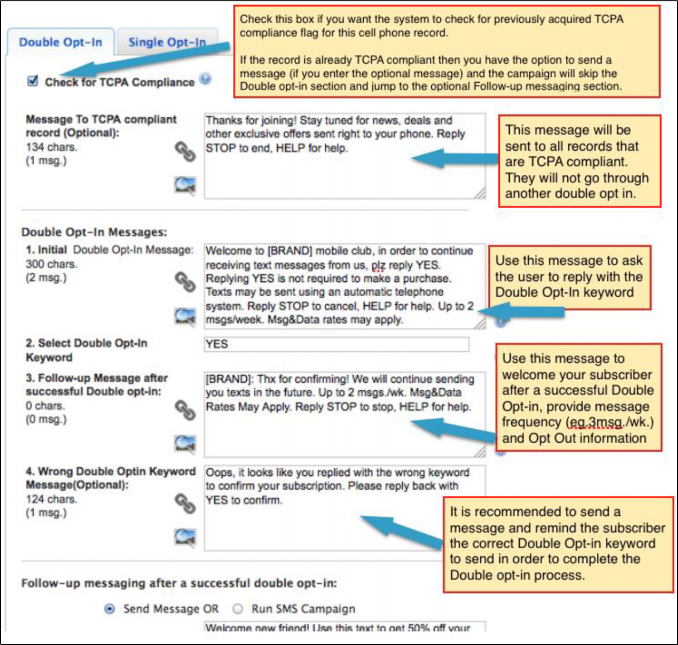 A subscriber that completes a Double Opt-in will automatically be flagged as “TCPA Compliant”. For Single Opt-in you can instruct the system to flag the subscriber as “TCPA Compliant” as long as such action is complaint with the TCPA guidelines. In this step, you’ll write the Auto-Responder message and perhaps configure some options. Think of it as a conversation template: here you are configuring the interaction between the SMS recipient and your campaign. Remember, the maximum length of the message is 160 characters. To add a short system-generated hyperlink, check the box for Add Short URL to this message. Click the Create Short URL button, and then enter a Title and the URL. The Title will be the display text for the link. 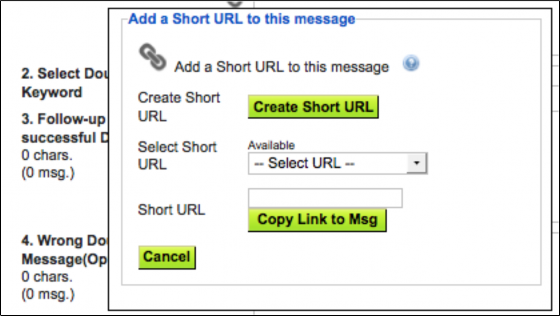 In the Select Short URL drop-down list, choose the link you just made to display the URL in the Short URL field. Now, click the Copy Link to Msg button to insert the link into the reply message text. 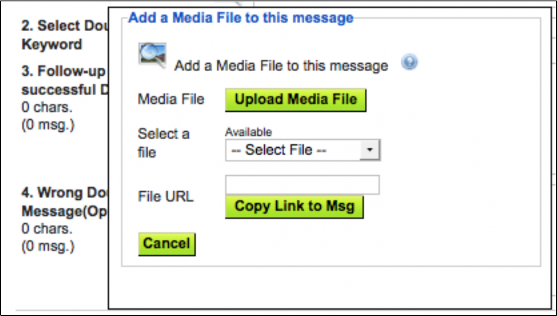 To add a media file (such as a video, image, or music), check the box for Add a Media File to this message. In the Select a file drop-down list, choose the link you just made to display the URL in the File URL field. Now, click the Copy Link to Msg button to insert the media file link into the reply message text. Click Next to move on to the Destination Database step. Check the box for Send Subscription Renewal Msg? if you want to send a monthly subscription reminder message to all of the contacts in your database . Click Submit to commit your changes; click Cancel to discard. 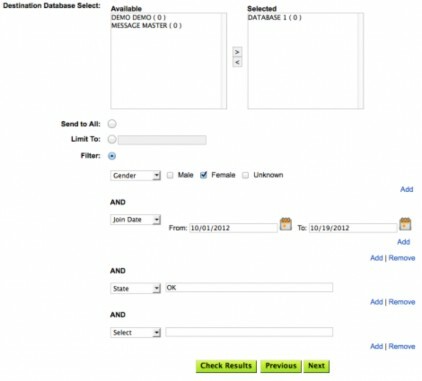 If at least one database already exists, you’ll see it in the Available listing (see the figure below). 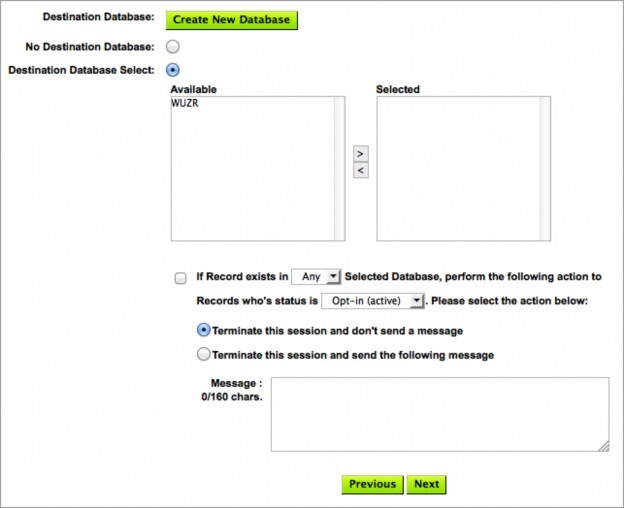 Follow the steps below to manage your databases. Click the database name in the Available listing, then click the right arrow to move the database name to the Selected listing. You can also double-click on the database name that you want to Select. If you want to take action when a duplicate entry is found in a database, check the If Record exists box. In the first drop-down, choose All if you want to this setting to apply only if a record is found in all databases in the Selected listing. Leave the default (Any) if you want this setting to apply to a record found in any of the selected databases. In the second drop down, the default option is Opt-in (Active). If you leave this option, the setting will only apply to duplicate records having an opt-in value. Instead, you might choose Opted-out (Inactive) or Any. Next, decide what happens when a duplicate is found. You can choose to Terminate this session and don’t send a message, or choose to send a message. If you choose the second option, then enter the Message. When you’re happy with your changes, click Next to continue to the last step. 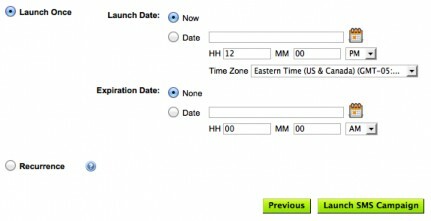 If you want to specify a launch date, click the Date radio button. If you want the campaign to begin immediately, click on Now. Click the calendar icon to select a date on which the campaign will begin. Enter the time in hours (HH) and minutes (MM), and choose AM or PM from the drop- down list. If you want to specify an expiration date, click the Date radio button. If you don’t want the campaign to expire click None. Click the calendar icon to select a date on which the campaign will expire. You may click the Previous button to return to prior steps. If you’re happy with all of the settings, click Launch SMS Campaign to commit your changes and return to the main page. The Broadcast feature is a tool for distributing SMS messages. We provide you with many options, and yet it’s quite easy to setup. In this step, you’ll write the message and perhaps configure some options. Begin by entering the message. You can enter a long message and the system will split it into two or more SMS messages but this may result in a higher count of MT being sent. You will see in the preview on the right, how the messages will be split. Read below about the options that you can enable for the broadcast. 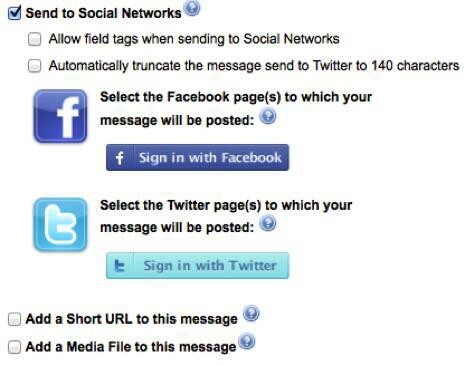 To send the message to Facebook, Twitter, or both, and check the box for Send to Social Networks. You may now click the Yes button for Facebook, Twitter or both. Click the pencil icon if you don’t see a default account, then enter the account details. To add a system-generated hyperlink, check the box for Add Short URL to this message. Click the Create Short URL button, then enter a Title and the URL. The Title will be the display text for the link. 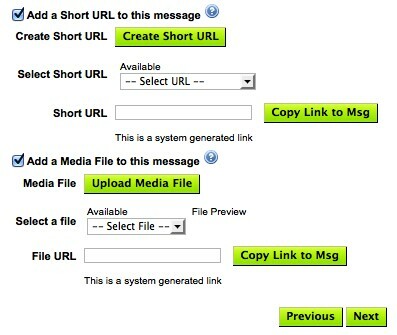 To add a system-generated hyperlink to a media file, check the box for Add a Media File to this message. Click the database name in the Available listing, then click the right arrow to move the database name to the Selected listing. One option to restrict the message distribution is Limit To. Click this radio button and then enter a value for the total number of messages that will be sent at random to the databases you’ve chosen. You can also choose to restrict by database columns by clicking the Filter radio button. Then choose a field from the drop-down listing, and then choose a value. For example, you could choose Carrier from the drop-down listing and then select AT&T Wireless. In this case, for the databases you’ve chosen, only those recipients whose records have AT&T Wireless as the carrier will receive a message. Click the Add link to append another filter, and follow the instructions in step 3. This is the last step, in which you’ll define the duration of the campaign by specifying the launch and expiration dates. The recurrence feature gives you the option of configuring multiple launches. The default settings are such that the campaign will begin immediately and have no expiration date. If you want the campaign to launch immediately, click Now. If you want to specify a launch date, click the Date radio button. You may click the Previous button to return to prior steps. If you’re happy with all of the of the settings, click Launch SMS Campaign to commit your changes and return to the main page. If you want to specify a launch date, click the Date radio button. If you want to specify an expiration date, click the Date radio button. Otherwise check the second radio button and enter the time in hours (HH) and minutes (MM), and choose AM or PM from the drop-down list. 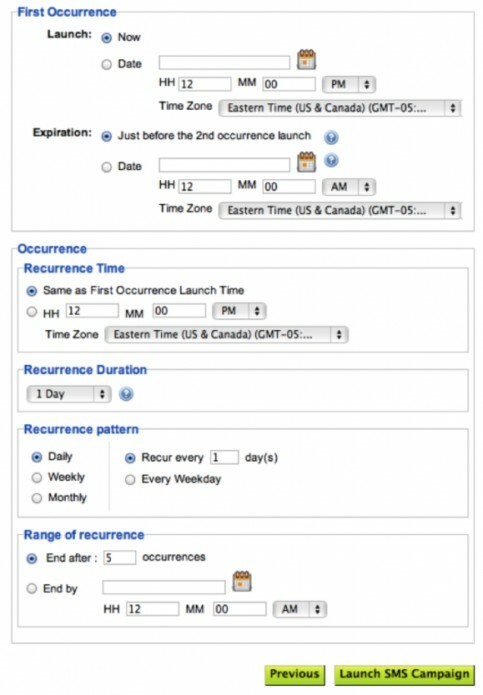 If you would like a Recurrence Duration different from the default (1 Day), select it from the drop-down list. The default Recurrence Pattern is Daily/Recur every 1 day. If you like, simply choose the options which match your preferences. You may also specify the Range of recurrence. This can either end after a specific number of occurrences, or you can specify a date and time on which the distributions will end. You may click the Previous button to return to prior steps. If you’re happy with all of settings, click the Launch SMS Campaign to commit your changes and return to the main page. The SMS Data Collection feature is a tool for creating campaigns that solicit responses through SMS text messages. We provide you with many options, and yet it’s quite easy to setup. You may access the Data Collection feature by choosing SMS Campaign > SMS Campaign Manager > Data Collection from the toolbar. In this step, you’ll write the SMS message, specify the response type, and then configure the follow-up response. Think of it as a conversation template: here you are configuring the interaction between the SMS recipient and your campaign. Remember, at 160 characters the system will split your message. You can see preview the SMS messages to the right of the screen in SMS Preview. From the Expected Answer drop-down list, choose the response type that you expect from the recipient. Naturally, the choice here must match the content of the Message. For example, if you choose DOB (date of birth) from the Expected Answer drop-down, then you will likely write something like “What is your birthday?” in the Message. Next, decide which Response you want to generate when the recipient sends the reply. 160-character limit. 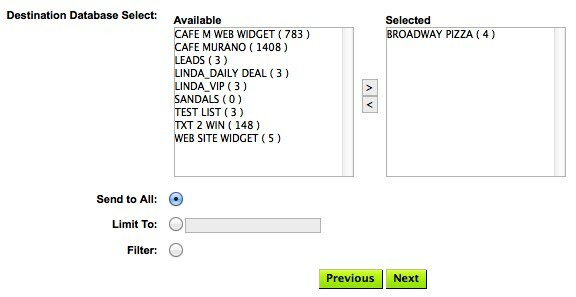 If you choose Run SMS Campaign, choose a predefined campaign from the drop-down list. NOTE:You’ll need to create and save at least one predefined campaign before it will appear in the drop-down listing. Enter a specific value in the If answer is field. You may choose one of two response types, either Send Message or Run SMS Campaign. If you choose Send Message, your message content has a 160-character limit. 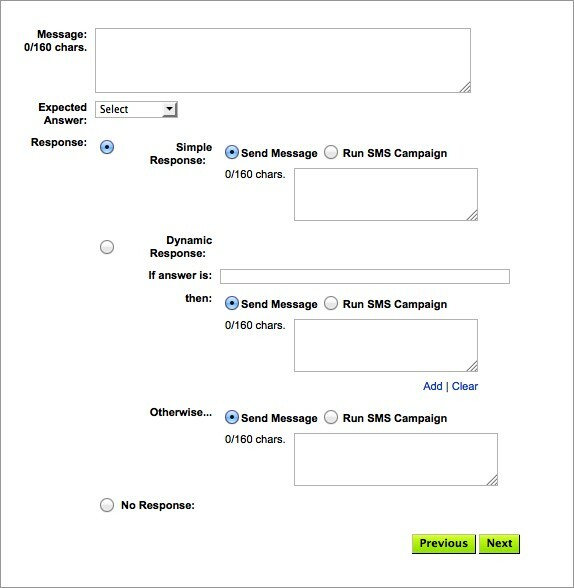 If you choose Run SMS Campaign, choose a predefined campaign from the drop-down list. Next, you’ll need to specify the response for an SMS reply that doesn’t match what you entered in the If answer is field. Simply choose either Send Message or Run SMS Campaign. NOTE: You’ll need to create and save at least one predefined campaign before it will appear in the drop-down listing. Click Add to add another dynamic response item; click Clear to remove a dynamic response item. No Response – Choose this option if you do not want to generate any response. 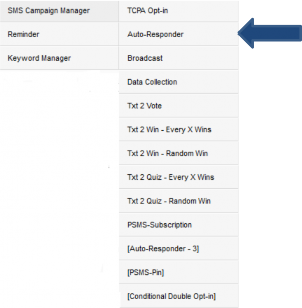 SMS recipient and your campaign. If you haven’t already, click Next to move on to the Destination Database step. Check the box for Send Subscription Renewal Msg? if you want to send a monthly renewal message to your database. Click the database name in the Available listing, then click the right arrow to move the database name to the Selected listing. You can also double-click on the database name to move it to the Selected side. In the first drop-down, choose All if you want to this setting to apply only if a duplicate is found in all databases in the Selected listing. Leave the default (Any) if you want this setting if at least one duplicate is found in any of the databases. If you want to specify a launch date, click the Date radio button. If not, click Now. If you want to specify an expiration date, click the Date radio button. If not, click None. 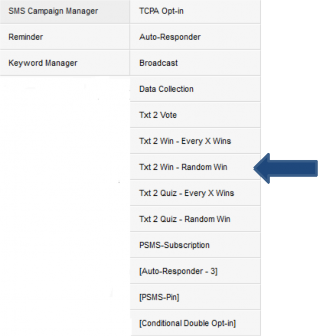 The Txt 2 Quiz – Random Win feature is a tool for creating simple campaigns that solicit SMS responses to a quizzing game in which the winning entries are chosen at random by the system. You specify the frequency of winning entries, the maximum number of winners, and several other options. It is easy to setup by following the instructions in this section. 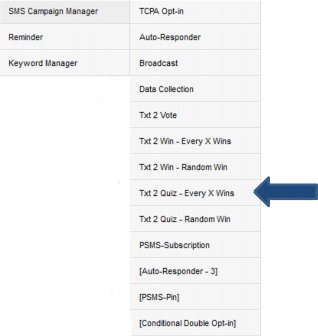 You may access this feature by choosing SMS Campaign > SMS Campaign Manager > Txt 2 Quiz Random Win from the toolbar. In this step, you’ll specify the frequency of winning entries, the maximum number of winners, and configure a number of options. Think of it as a conversation template: here you are configuring the interaction between the SMS recipient and your campaign. Remember, the maximum length of the message (and error message) is 160 characters. Begin by entering the Response After Participant Entry. This is the response message that will be sent to each participant when their entry message is received by the system. Next, decide if you want to offer a hint. If so, choose Yes for Can Record reply HINT? and then enter the Hit Message and the Expected Answer. reaching the Max number of participants, or at any time upon the SMS Campaign Manager request. Place a limit on the number of winners by entering a value in the Max # of Winners field. Limit the number of entries per SMS number by entering a value in the Max Entries Allowed By Same Participant field. For example, if you specify the value as “1”, then only one entry per number is acceptable. 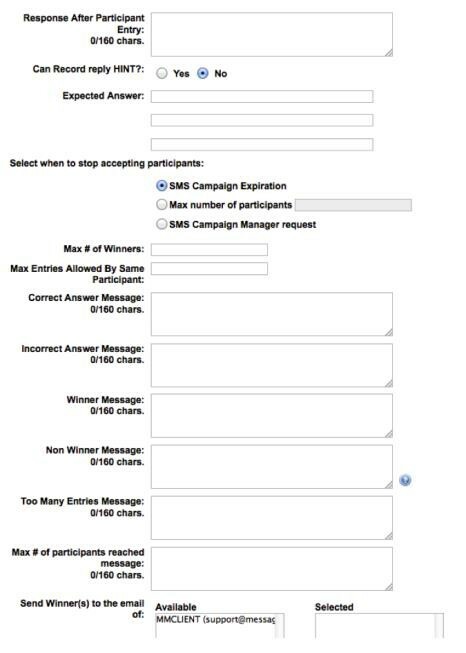 If a participant exceeds this maximum, they will receive the message you write in the Too Many Entries Message field (see below). Enter both a Correct Answer Message and an Incorrect Answer Message. Each winning participant will receive the message you write into Winner Message. All others will receive the message you place into the Non-Winner Message field. 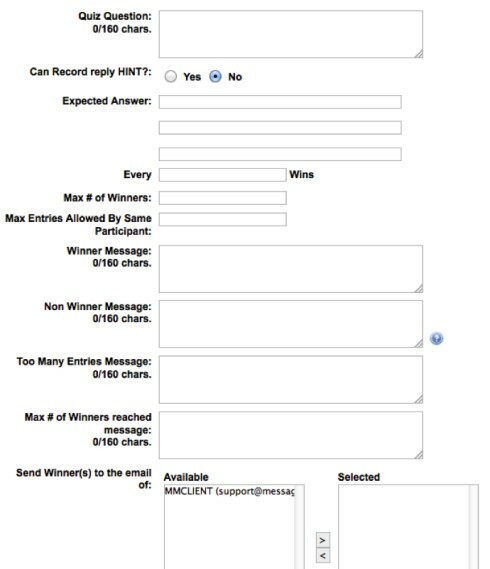 In the field Too Many Entries Message, enter the message that will be sent to those participants who attempt to exceed the Max Entries Allowed by the Same Participant (see above). The contest is over when the Max # of Winners has been reached (see above). In the Max # of Winners reached message field, enter the message that will be sent to anyone who attempts to participate in the game after the contest is over. Finally, you’ll need to select the email address to which the winning numbers will be sent. For Send Winner(s) to the email of, select the email address from the Available listing by clicking the small arrow. The Txt 2 Quiz feature is a tool for creating simple campaigns that solicit SMS responses to a quizzing game in which the winning entries occur at regular intervals. You specify the frequency of winning entries, the maximum number of winners, and several other options. It is easy to setup by following the instructions in this section. Every X Wins from the toolbar. Begin by entering the Quiz Question. This is the initial question that is sent to each participant. Enter a value for Every X Wins. This is the win frequency. If, for example, you enter “50”, then 1 out of every 50 replies will be a winner. Every winning participant will receive the message you write into Winner Message. All others will receive the message you place into the Non-Winner Message field. 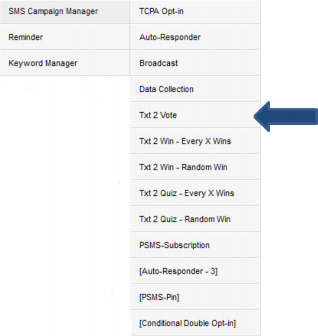 The Txt 2 Vote feature is a tool for creating simple campaigns that solicit voting responses through SMS text messages. We provide you with many options, and yet it’s quite easy to setup. In this step, you’ll specify the voting answers, write the primary message and the error message, and configure a number of options. Think of it as a conversation template: here you are configuring the interaction between the SMS recipient and your campaign. Remember, the maximum length of the message (and error message) is 160 characters. Begin by entering the Allowed Answers. 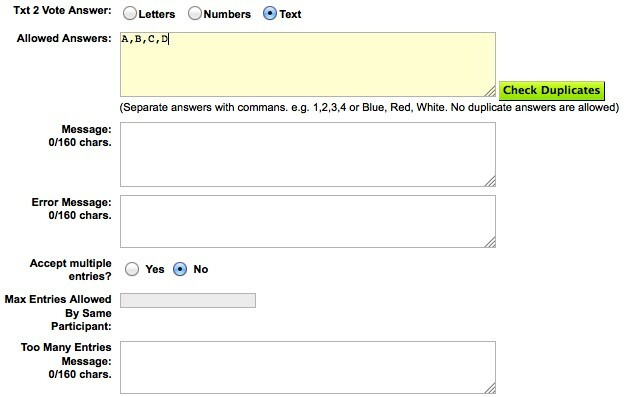 This can be a list of numbers or letters, such as “A,B,C,D” You can click the Check Duplicates button to ensure that each item in the list is unique. Enter a Message containing instructions on how to vote. Also enter an Error Message, which will contain instructions for the recipient to correct their previous message. If you want to allow multiple choices in the response, click Yes to Accept Multiple Entries. If you want to limit participant response, specify the Maximum Entries Allowed By Same Participant , and also enter the Too Many Entries Message. SMS reply. You may choose one of two responses types, either Send Message or Run SMS Campaign. If you choose Send Message, your message content has a 160-character limit. 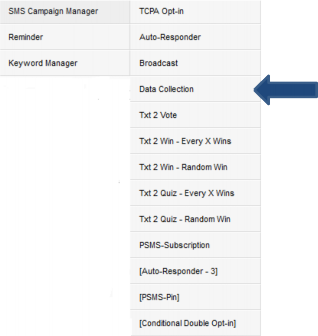 If you choose Run SMS Campaign, choose a predefined campaign from the drop-down list. You may choose one of two responses types, either Send Message or Run SMS Campaign. If you choose Send Message, your message content has a 160-character limit. 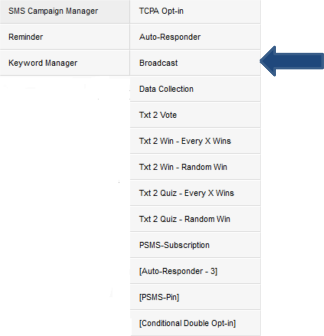 If you choose Run SMS Campaign, choose a predefined campaign from the drop-down list. b. Current Txt 2 Vote Results– this option will generate a simple reply containing the vote results. d. No Response – Choose this option if you do not want to generate any response. You can also send all responses to an email address of your choosing. Simply select one or more email addresses in the Send Result to Email listing. 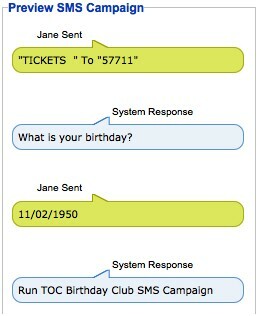 SMS responses to participate in a game in which the winning entries are chosen at random by the system. Also, you may specify the frequency of winning entries, the maximum number of winners, and several other options. It is easy to setup by following the instructions in this section. You may access this feature by choosing SMS Campaign > SMS Campaign Manager > Txt 2 Win Random Win from the toolbar. Next, make a choice for Select when to stop accepting participants. 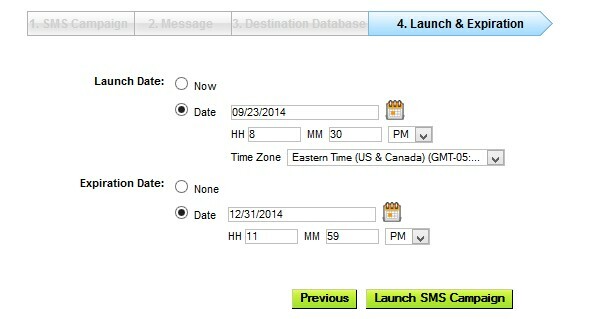 The default setting is at the SMS Campaign Expiration, which is the date on which the campaign ends (see the Launch & Expiration section below). You can also stop accepting participants upon reaching the Max number of participants , or at any time upon the SMS Campaign Manager request. for Can the same number win more than one time? Click the database name in the Available listing, and then click the right arrow to move the database name to the Selected listing. 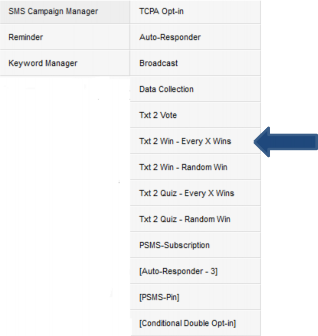 The Txt 2 Win feature is a tool for creating simple campaigns that solicit SMS responses to participate in a game in which winning entries occur at regular intervals. Also, you may specify the frequency of winning entries, the maximum number of winners, and several other options. It is easy to setup by following the instructions in this section. Begin by entering the Every X Wins. This is the win frequency. If, for example, you enter “50”, then 1 out of every 50 replies will be a winner.